"SR-71" redirects here. For other uses, see SR-71 (disambiguation). An SR-71B trainer over the Sierra Nevada Mountains of California in 1994. The raised second cockpit is for the instructor. The Lockheed SR-71 "Blackbird" is a long-range, Mach 3+ strategic reconnaissance aircraft that was operated by the United States Air Force. It was developed as a black project from the Lockheed A-12 reconnaissance aircraft in the 1960s by Lockheed and its Skunk Works division. American aerospace engineer Clarence "Kelly" Johnson was responsible for many of the design's innovative concepts. During aerial reconnaissance missions, the SR-71 operated at high speeds and altitudes to allow it to outrace threats. If a surface-to-air missile launch were detected, the standard evasive action was simply to accelerate and outfly the missile. The shape of the SR-71 was based on the A-12 which was one of the first aircraft to be designed with a reduced radar cross-section. The SR-71 was designed for flight at over Mach 3 with a flight crew of two in tandem cockpits, with the pilot in the forward cockpit and the reconnaissance systems officer operating the surveillance systems and equipment from the rear cockpit, and directing navigation on the mission flight path. The SR-71 was designed to minimize its radar cross-section, an early attempt at stealth design. Finished aircraft were painted a dark blue, almost black, to increase the emission of internal heat and to act as camouflage against the night sky. The dark color led to the aircraft's nickname "Blackbird". The high temperatures generated in flight required special design and operating techniques. Major portions of the skin of the inboard wings were corrugated, not smooth. Aerodynamicists initially opposed the concept, disparagingly referring to the aircraft as a Mach 3 variant of the 1920s-era Ford Trimotor, known for its corrugated aluminum skin. The heat would have caused a smooth skin to split or curl, whereas the corrugated skin could expand vertically and horizontally and had increased longitudinal strength. Water vapor is condensed by the low-pressure vortices generated by the chines outboard of each engine inlet. Downstream of this normal shock, the air is subsonic. It decelerates further in the divergent duct to give the required speed at entry to the compressor. Capture of the plane's shock wave within the inlet is called "starting the inlet". Bleed tubes and bypass doors were designed into the inlet and engine nacelles to handle some of this pressure and to position the final shock to allow the inlet to remain "started". The SR-71 originally included optical/ infrared imagery systems; side-looking airborne radar (SLAR) ; electronic intelligence (ELINT) gathering systems ; defensive systems for countering missile and airborne fighters    ; and recorders for SLAR, ELINT, and maintenance data. The SR-71 carried a Fairchild tracking camera and an infrared camera,  both of which ran during the entire mission. SR-71s first arrived at the 9th SRW's Operating Location (OL-8) at Kadena Air Base, Okinawa on 8 March 1968. These deployments were code named "Glowing Heat", while the program as a whole was code named "Senior Crown". Reconnaissance missions over North Vietnam were code named "Giant Scale". 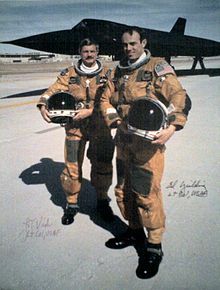 On 21 March 1968, Major (later General) Jerome F. O'Malley and Major Edward D. Payne flew the first operational SR-71 sortie in SR-71 serial number 61-7976 from Kadena AFB, Okinawa. During its career, this aircraft (976) accumulated 2,981 flying hours and flew 942 total sorties (more than any other SR-71), including 257 operational missions, from Beale AFB; Palmdale, California; Kadena Air Base, Okinawa, Japan; and RAF Mildenhall, UK. The aircraft was flown to the National Museum of the United States Air Force near Dayton, Ohio in March 1990. Only one crew member, Jim Zwayer, a Lockheed flight-test reconnaissance and navigation systems specialist, was killed in a flight accident. The rest of the crew members ejected safely or evacuated their aircraft on the ground. European operations were from RAF Mildenhall, England. There were two routes. One was along the Norwegian west coast and up the Kola Peninsula, which contained several large naval bases belonging to the Soviet Navy's Northern Fleet. Over the years, there were several emergency landings in Norway, four in Bodø and two of them in 1981 (flying from Beale) and 1985. Rescue parties were sent in to repair the planes before leaving. On one occasion, one complete wing with engine was replaced as the easiest way to get the plane airborne again. The other route, from Mildenhall over the Baltic Sea, was known as the Baltic Express. On April 15, 1986, the US Navy and USAF attacked targets in Libya. Some time later, an SR-71 (61-7980) sortied out on a Post-Bombing-Analysis mission. Before approaching the target area, the crew noticed that one of the F-111s was missing, it was shot down during the raid and crashed into the Mediterranean Sea. During the mission, it was fired on by Surface to Air Missiles. In an effort to outrun them, the crew throttled up to full speed. This enabled it to avoid the missiles. It successfully landed back in RAF Mildenhall. From the operator's perspective, what I need is something that will not give me just a spot in time but will give me a track of what is happening. When we are trying to find out if the Serbs are taking arms, moving tanks or artillery into Bosnia, we can get a picture of them stacked up on the Serbian side of the bridge. We do not know whether they then went on to move across that bridge. We need the [data] that a tactical, an SR-71, a U-2, or an unmanned vehicle of some sort, will give us, in addition to, not in replacement of, the ability of the satellites to go around and check not only that spot but a lot of other spots around the world for us. It is the integration of strategic and tactical. The reactivation met much resistance: the Air Force had not budgeted for the aircraft, and UAV developers worried that their programs would suffer if money was shifted to support the SR-71s. Also, with the allocation requiring yearly reaffirmation by Congress, long-term planning for the SR-71 was difficult. In 1996, the Air Force claimed that specific funding had not been authorized, and moved to ground the program. Congress reauthorized the funds, but, in October 1997, President Bill Clinton attempted to use the line-item veto to cancel the $39 million allocated for the SR-71. In June 1998, the U.S. Supreme Court ruled that the line-item veto was unconstitutional. All this left the SR-71's status uncertain until September 1998, when the Air Force called for the funds to be redistributed; the Air Force permanently retired it in 1998. The SR-71 also holds the "speed over a recognized course" record for flying from New York to London—distance 3,461.53 miles (5,570.79 km), 1,806.964 miles per hour (2,908.027 km/h), and an elapsed time of 1 hour 54 minutes and 56.4 seconds—set on 1 September 1974, while flown by U.S. Air Force pilot James V. Sullivan and Noel F. Widdifield, reconnaissance systems officer (RSO). This equates to an average speed of about Mach 2.72, including deceleration for in-flight refueling. Peak speeds during this flight were likely closer to the declassified top speed of over Mach 3.2. For comparison, the best commercial Concorde flight time was 2 hours 52 minutes and the Boeing 747 averages 6 hours 15 minutes. West Coast to East Coast, distance 2,404 miles (3,869 km), average speed 2,124.5 miles per hour (3,419.1 km/h), and an elapsed time of 67 minutes 54 seconds. Kansas City, Missouri, to Washington, D.C., distance 942 miles (1,516 km), average speed 2,176 miles per hour (3,502 km/h), and an elapsed time of 25 minutes 59 seconds. St. Louis, Missouri, to Cincinnati, Ohio, distance 311.4 miles (501.1 km), average speed 2,189.9 miles per hour (3,524.3 km/h), and an elapsed time of 8 minutes 32 seconds. Speculation existed regarding a replacement for the SR-71, including a rumored aircraft codenamed Aurora. The limitations of reconnaissance satellites, which take up to 24 hours to arrive in the proper orbit to photograph a particular target, make them slower to respond to demand than reconnaissance planes. The fly-over orbit of spy satellites may also be predicted and can allow assets to be hidden when the satellite is above, a drawback not shared by aircraft. Thus, there are doubts that the US has abandoned the concept of spy planes to complement reconnaissance satellites. Unmanned aerial vehicles (UAVs) are also used for much aerial reconnaissance in the 21st century, being able to overfly hostile territory without putting human pilots at risk, as well as being smaller and harder to detect than man-carrying aircraft. SR-71A was the main production variant. Twelve SR-71s were lost and one pilot died in accidents during the aircraft's service career. Eleven of these accidents happened between 1966 and 1972. 61-7977 SR-71A Lost, 10 October 1968. Cockpit section survived and located at the Seattle Museum of Flight. ^ See the opening fly page in Paul Crickmore's book SR-71, Secret Missions Exposed, which contains a copy of the original R-12 labeled plan view drawing of the vehicle. ^ Lockheed obtained the metal from the USSR during the Cold War, under many guises to prevent the Soviet government from discovering for what it was to be used. ^ See Blackbird with Canards image for visual. ^ "SR-71 Blackbird." lockheedmartin.com. Retrieved: 14 March 2010. 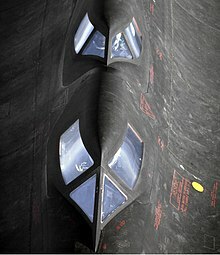 ^ a b "SR71 Blackbird." PBS documentary, Aired: 15 November 2006. ^ a b c d e Landis and Jenkins 2005, pp. 98, 100–101. ^ a b c Pace 2004, pp. 126–127. ^ a b Crickmore 1997, p. 64. ^ Landis and Jenkins 2005, p. 78. ^ Pace 2004, p. 159. ^ a b c d "Records: Sub-class : C-1 (Landplanes) Group 3: turbo-jet." records.fai.org. Retrieved: 30 June 2011. ^ Rich and Janos 1994, p. 85. ^ McIninch 1996, p. 31. ^ a b c Robarge, David. "A Futile Fight for Survival. Archangel: CIA's Supersonic A-12 Reconnaissance Aircraft." CSI Publications, 27 June 2007. Retrieved: 13 April 2009. ^ Cefaratt; Gill (2002). Lockheed: The People Behind the Story. Turner Publishing Company. pp. 78, 158. ISBN 978-1-56311-847-0. ^ "Lockheed B-71 (SR-71)". National Museum of the United States Air Force. 29 October 2009. Archived from the original on 4 October 2013. Retrieved 2 October 2013. ^ a b Landis and Jenkins 2005, pp. 56–57. ^ McIninch 1996, p. 29. ^ McIninch 1996, pp. 14–15. ^ Merlin 2005, pp. 4–5. ^ Landis and Jenkins 2005, p. 47. ^ Merlin 2005, p. 6. ^ "Senior Crown SR-71." Federation of American Scientists, 7 September 2010. Retrieved: 17 October 2012. Archived on 17 April 2015. ^ a b c d e f g h Graham, Richard (7 July 1996). SR-71 Revealed: The Inside Story. Zenith Press. ISBN 978-0760301227. ^ Crickmore 2009, pp. 30–31. ^ "MiG-25 Foxbat." globalaircraft.org. Retrieved: 31 May 2011. Archived in 2014. ^ Rich and Janos 1994, pp. 213–214. ^ Rich and Janos 1994, p. 203. ^ McIninch 1996, p. 5. ^ Graham, 1996, p. 47. ^ a b Graham, 1996, p. 160. ^ Burrows, William E. (1 March 1999). "The Real X-Jet". Smithsonian Air & Space. Retrieved 16 January 2018. ^ Graham, 1996, p. 41. ^ "Lockheed SR-71 "Blackbird" - Air Power Provided". Dutchops.com. ^ Blackbird diaries, Air & Space, December 2014/January 2015, p. 46. ^ a b Dowling, Stephen (2 July 2013). 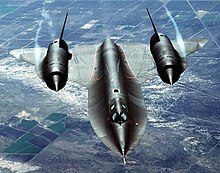 "SR-71 Blackbird: The Cold War's ultimate spy plane". BBC. Retrieved 4 May 2017. ^ a b "OXCART vs Blackbird: Do You Know the Difference? — Central Intelligence Agency". Cia.gov. ^ Graham, 1996, p. 75. ^ Hott, Bartholomew and George E. Pollock "The Advent, Evolution, and New Horizons of United States Stealth Aircraft." archive.is. Retrieved: 7 February 2014. ^ Suhler 2009, p. 100. ^ Suhler 2009, ch. 10. ^ AirPower May 2002, p. 36. ^ Goodall 2003, p. 19. ^ AirPower, May 2002, p. 33. ^ "SR-71 manual, Air Inlet System". sr-71.org. Retrieved: 14 March 2010. 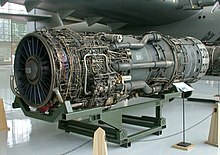 ^ "Penn State- turbo ramjet engines." personal.psu.edu. Retrieved: 14 March 2010. ^ Crickmore 1997, pp. 42–43. ^ Landis and Jenkins 2005, p. 97. ^ "NASA Dryden Technology Facts - YF-12 Flight Research Program". US: NASA. 2004. Retrieved 9 March 2019. ^ Rich and Janos 1994, p. 221. ^ Landis and Jenkins 2005, p. 83. ^ a b Kloesel, Kurt J., Nalin A. Ratnayake and Casie M. Clark. "A Technology Pathway for Airbreathing, Combined-Cycle, Horizontal Space Launch Through SR-71 Based Trajectory Modeling." NASA: Dryden Flight Research Center. Retrieved: 7 September 2011. ^ Gibbs, Yvonne (12 August 2015). "NASA Armstrong Fact Sheet: SR-71 Blackbird". NASA. Retrieved 29 May 2017. ^ "SR-71." yarchive.net. Retrieved: 14 March 2010. ^ "SR-71 Online - SR-71 Flight Manual: Section 1, Page 1-20". Sr-71.org. ^ SR-71 Revealed Richard H. Graham Col USAF (Retd) ISBN 978-0-7603-0122-7, p. 51. ^ Landis and Jenkins 2005, pp. 95–96. ^ "Starter Cart". SR-71 Online. US. 2010. Retrieved 21 July 2018. ^ Marshall, Elliot, The Blackbird's Wake, Air and Space, October/November 1990, p. 35. ^ Graham, 1996, pp. 38–39. ^ Paul Crickmore, Lockheed Blackbird: Beyond The Secret Missions, 1993, p. 233. ^ "SR-71A-1 Flight Manual, Section IV, p. 3." sr-71.org. Retrieved: 13 December 2011. ^ "SR-71 Pilot Interview Richard Graham Veteran Tales". YouTube. ^ "SR-71 Online - SR-71 Flight Manual: Section 4, Page 4-86". Sr-71.org. ^ "SR-71 Online - SR-71 Flight Manual: Section 4, Page 4-99". Sr-71.org. ^ "SR-71 Online - SR-71 Flight Manual: Section 4, Page 4-123". Sr-71.org. ^ "SR-71 Online - SR-71 Flight Manual: Section 4, Page 4-129". Sr-71.org. ^ "SR-71 Online - SR-71 Flight Manual: Section 4, Page 4-132". Sr-71.org. ^ "SR-71 Online - SR-71 Flight Manual: Section 4, Page 4-146". Sr-71.org. ^ David Robarge. "ARCHANGEL" (PDF). Cia.gov. Retrieved 19 March 2019. ^ a b c d Crickmore 1997, p. 74. ^ Crickmore 1997, p. 563. ^ Crickmore 1997, p. 77. ^ "Blackbird Diaries | Flight Today". Air & Space Magazine Air & Space magazine: 45. December 2014. Retrieved 24 July 2015. ^ a b c "Bill Weaver SR-71 Breakup." Roadrunners Internationale, 10 September 2011. Retrieved: 3 March 2012. ^ Donald 2003, p. 172. ^ Popular Mechanics, June 1991, p. 28. ^ Ehrenfried, Manfred (2013). Stratonauts: Pioneers Venturing into the Stratosphere. ISBN 978-3-319-02901-6. ^ "SR-71 Maintenance". Blackbirds.net. Retrieved 29 October 2015. ^ Shul, Brian (1992). Sled Driver. Earl Shilton, Leicester, England: Midland Publishing Limited. pp. 38–40. ISBN 9781857800029. ^ Crickmore 1997, pp. 56, 58. ^ "Col. Richard Graham (USAF, Ret.)". Habu.org. The Online Blackbird Museum. Retrieved 16 January 2016. ^ a b Shul, Brian (1994). The Untouchables. Mach One. p. 173. ISBN 0929823125. ^ Crickmore 1997, p. 59. ^ a b Crickmore 1997, pp. 62–64. ^ Norros, Guy, "Hyper ops", Aviation Week & Space Technology, July 20 – August 2, 2015, p. 28. ^ Donald 2003, p. 167. ^ Little, Richard (22 September 2015). "Bye Bye U-2: CIA Legend Allen Predicts End Of Manned Reconnaissance". Breaking Defense. Retrieved 29 May 2017. ^ Bonafede, Håkon (22 April 2012). "SPIONFLY, DEN KALDE KRIGEN - Spionfly landet i Bodø" [Spy plane, The Cold War - Spy plane landed in Bodø] (in Norwegian). Norway: Side3. Retrieved 11 September 2017. ^ Haynes, Leland. "SR-71 Bodo Norway Operations". Retrieved 7 October 2017. ^ Bonafede, Håkon (10 May 2018). "På skuddhold av SR-71 Blackbird" [Shooting of the SR-71]. Side3 (in Swedish). Sweden. Retrieved 12 May 2018. ^ Flyghistorisk Revy – System 37 Viggen, Stockholm: Svensk Flyghistorisk Förening, 2009, ISSN 0345-3413. ^ Mach 14, vol 4, no 3, 1983, p. 5. ISSN 0280-8498. ^ Mach 25, vol 7, no 2, 1986, pp. 28–29. ISSN 0280-8498. ^ Darwal 2004, pp. 151–156. ^ Marshall, Eliot, "The Blackbird's Wake", Air & Space, October/November 1990, p. 35. ^ Crickmore 1997, pp. 84–85. ^ Crickmore 1997, p. 81. ^ a b c "Department of Defense Authorization for Appropriations for Fiscal Year 1994 and The Future Years." United States Senate, May–June 1993. ^ "NASA/DFRC SR-71 Blackbird." NASA. Retrieved: 16 August 2007. ^ Landis and Jenkins 2005, p. 58. ^ Shul and Watson 1993, pp. 113–114. ^ Landis and Jenkins 2005, pp. 77–78. 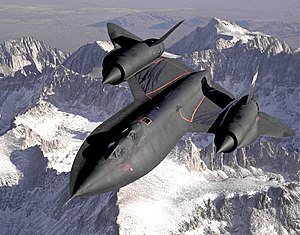 ^ "SR-71 World Record Speed and Altitude Flights". Wvi.com. ^ a b "A-12, YF-12A, & SR-71 Timeline of Events". Voodoo-world.cz. ^ a b "Blackbird Records." sr-71.org. Retrieved: 18 October 2009. ^ "1966 Lockheed SR-71." Archived 28 July 2011 at the Wayback Machine vam.smv.org. Retrieved: 14 February 2011. ^ "Spy Plane Sets Speed Record, Then Retires." The New York Times, 7 March 1990. ^ Marshall, Elliot, The Blackbird's Wake, Air & Space, October/November 1990, p. 31. ^ Richard H. Graham. SR-71 Revealed : The Untold Story. Zenith Imprint. ISBN 978-1-61060-751-3. ^ Siuru, William D. and John D. Busick. Future Flight: The Next Generation of Aircraft Technology. Blue Ridge Summit, Pennsylvania: TAB Books, 1994. ISBN 0-8306-7415-2. ^ Norris, Guy (1 November 2013). "Exclusive: Skunk Works Reveals SR-71 Successor Plan". Aviation Week. Penton. Archived from the original on 11 August 2014. Retrieved 1 November 2013. ^ Trimble, Stephen (1 November 2013). "Skunk Works reveals Mach 6.0 SR-72 concept". Flightglobal.com. Reed Business Information. Archived from the original on 21 January 2014. Retrieved 1 November 2013. ^ Butler, Amy; Sweetman, Bill (6 December 2013). "EXCLUSIVE: Secret New UAS Shows Stealth, Efficiency Advances". Aviation Week. Penton. Retrieved 6 December 2013. ^ Landis and Jenkins 2005, pp. 56–58. ^ Landis and Jenkins 2005, pp. 62, 75. ^ Merlin 2005, p. 4. ^ Pace 2004, pp. 109–110. ^ "U-2 and SR-71 Units, Bases and Detachments". Umcc.ais.org. Retrieved 29 October 2015. ^ "BEALE AFB 99TH Reconnaissance Squadron". Mybaseguide.com. Retrieved 29 October 2015. ^ "Fall and Rise of the Blackbird". Blackbirds.net. ^ Fact Sheet: SR-71 Blackbird. NASA Armstrong Flight Research Center. Retrieved 28 April 2015. ^ "Lockheed YF-12A". National Museum of the US Air Force™. ^ "SR-71 Online - YF-12 Locations". Sr-71.org. ^ Bill Weaver & Maury Rosenberg. BD-0066 Oral History, Bill Weaver and Maury Rosenberg Lockheed SR-71 Pilots (Video). San Diego Air & Space Museum. Event occurs at 1h12m40s. ^ "SR-71 #953 crash." check-six.com. Retrieved: 12 November 2012. ^ SR-71A Blackbird Archived 16 October 2013 at the Wayback Machine Air Force Flight Center Museum. Retrieved: 10 February 2009. ^ Exhibits . Air Force Armament Museum. Retrieved: 10 February 2009. ^ "Aircraft On Display: Lockheed SR-71A Blackbird." The American Air Museum, Imperial War Museum. Retrieved: 10 February 2009. ^ "Aircraft: Lockheed SR-71A Blackbird". March Field Air Museum. Archived from the original on 4 March 2000. Retrieved 5 May 2009. .
^ "Fear the Bunny!". Warrior Flight Charity. Retrieved 24 March 2018. ^ U-2 / A-12 / YF-12A / SR-71 Blackbird & RB-57D – WB-57F locations.' Archived 18 February 2011 at the Wayback Machine u2sr71patches.co.uk. Retrieved: 22 January 2010. ^ "Frontiers of Flight Museum." flightmuseum.com. Retrieved: 14 March 2010. ^ a b Pace 2004, p. 110. ^ Graham 1996, p. 48. ^ Graham 2002, pp. 93, 223. "A Bittersweet and Fancy Flight." Philadelphia Inquirer, 7 March 1990, p. 1. Crickmore, Paul F. "Blackbirds in the Cold War". Air International, January 2009, pp. 30–38. Stamford, UK: Key Publishing. Crickmore, Paul F. "Lockheed's Blackbirds – A-12, YF-12 and SR-71A". Wings of Fame, Volume 8, 1997, pp. 30–93. London: Aerospace Publishing. ISBN 1-86184-008-X. Donald, David, ed. "Lockheed's Blackbirds: A-12, YF-12 and SR-71". Black Jets. AIRtime, 2003. ISBN 1-880588-67-6. Edwards, Owen (July 2009). "The Ultimate Spy Plane". Smithsonian Magazine. Retrieved 27 November 2017. The 32 Blackbirds cost an average of $34 million each. Goodall, James. Lockheed's SR-71 "Blackbird" Family. Hinckley, UK: Aerofax/Midland Publishing, 2003. ISBN 1-85780-138-5. Graham, Richard H. SR-71 Blackbird: Stories, Tales, and Legends. North Branch, Minnesota: Zenith Imprint, 2002. ISBN 0-7603-1142-0. Graham, Richard H. SR-71 Revealed: The Inside Story. St. Paul, Minnesota: MBI Publishing Company, 1996. ISBN 978-0-7603-0122-7. Graham, Richard H. SR-71: The Complete Illustrated History of the Blackbird, The World's Highest, Fastest Plane 2013. ISBN 978-0760343272. Jenkins, Dennis R. Lockheed Secret Projects: Inside the Skunk Works. St. Paul, Minnesota: MBI Publishing Company, 2001. ISBN 978-0-7603-0914-8. Johnson, C.L. Kelly: More Than My Share of it All. Washington, DC: Smithsonian Books, 1985. ISBN 0-87474-491-1. Landis, Tony R. and Dennis R. Jenkins. Lockheed Blackbirds. Minneapolis, Minnesota: Specialty Press, revised edition, 2005. ISBN 1-58007-086-8. McIninch, Thomas. " The Oxcart Story". Center for the Study of Intelligence, Central Intelligence Agency, 2 July 1996. Retrieved: 10 April 2009. Merlin, Peter W. From Archangel to Senior Crown: Design and Development of the Blackbird., Reston, Virginia: American Institute of Aeronautics and Astronautics (AIAA), 2008. ISBN 978-1-56347-933-5. Merlin, Peter W. "The Truth is Out There... SR-71 Serials and Designations". Air Enthusiast, No. 118, July/August 2005. Stamford, UK: Key Publishing, pp. 2–6. ISSN 0143-5450. Pace, Steve. Lockheed SR-71 Blackbird. Swindon, UK: Crowood Press, 2004. ISBN 1-86126-697-9. Remak, Jeannette and Joe Ventolo Jr. A-12 Blackbird Declassified. St. Paul, Minnesota: MBI Publishing Company, 2001. ISBN 0-7603-1000-9. Rich, Ben R. and Leo Janos. Skunk Works: A Personal Memoir of My Years at Lockheed. New York: Little, Brown and Company, 1994. ISBN 0-316-74330-5. Shul, Brian and Sheila Kathleen O'Grady. Sled Driver: Flying the World's Fastest Jet. Marysville, California: Gallery One, 1994. ISBN 0-929823-08-7. Shul, Brian and Walter Watson Jr. The Untouchables. Chico, California: Mach 1, Inc. 1993. ISBN 0-929823-12-5. Suhler, Paul A. From RAINBOW to GUSTO: Stealth and the Design of the Lockheed Blackbird (Library of Flight Series) . Reston, Virginia: American Institute of Aeronautics and Astronautics (AIAA), 2009. ISBN 978-1-60086-712-5. Brandt, Steven A., Randall J. Stiles and John J. Bertin. Introduction to Aeronautics: A Design Perspective. Reston, Virginia: American Institute of Aeronautics & Astronautics, 2004, pp. 141–150. ISBN 1-56347-701-7. Brown, Kevin V. "America's SuperSecret Spy Plane." Popular Mechanics, June 1968, pp. 59–62, 190. Clarkson, Jeremy. I Know You Got Soul. London: Penguin Books Limited, 2006. ISBN 0-14-102292-2. Crickmore, Paul F. Lockheed Blackbird: Beyond the Secret Missions. Oxford, UK: Osprey Publishing, 2004. ISBN 1-84176-694-1. Crickmore, Paul and Jim Laurier. Lockheed SR-71 Operations in the Far East. Oxford, UK: Osprey Publishing, 2008. ISBN 1-84603-319-5. Darwall, Bjarne. Luftens Dirigenter(Air Conductors) (in Swedish). Nässjö, Sweden: Air Historic Research AB, 2004. ISBN 91-973892-6-9. Goodall, James and Jay Miller. "Lockheed's SR-71 'Blackbird' Family A-12, F-12, M-21, D-21, SR-71". Hinckley, UK: AeroFax-Midland Publishing, 2002. ISBN 1-85780-138-5. Grant, R.G. Flight: 100 Years of Aviation. New York: DK Publishing, 2007. ISBN 978-0-7566-1902-2. Merlin, Peter W. Design and Development of the Blackbird: Challenges and Lessons Learned., Orlando, Florida: American Institute of Aeronautics and Astronautics (AIAA), 2009. AIAA 2009-1522. Merlin, Peter W. Mach 3+: NASA USAF YF-12 Flight Research 1969–1979. Washington, D.C.: Diane Publishing Co., NASA History Division Office, 2002. ISBN 1-4289-9458-0. Pappas, Terry. "The Blackbird is Back." Popular Mechanics, June 1991, pp. 27–31, 104–105. Periscope Film Com. Sr-71 Blackbird Pilot's Flight Manual. Lulu.com, 2006. ISBN 1-4116-9937-8. Reithmaier, Lawrence W. Mach 1 and Beyond. New York: McGraw-Hill, 1994, pp. 220–237. ISBN 0-07-052021-6. Wikimedia Commons has media related to SR-71 Blackbird. Robert R. Ropelewski (18 May 1981). "SR-71 Impressive in High-speed Regime" (PDF). Aviation Week & Space Technology. Pilot Report. SR-71 Flight Manual (PDF). 31 July 1989. Roger Mola (20 November 2014). "What a Blackbird Drinks". Air & Space Magazine. Air & Space/Smithsonian. "Blackbird Diaries". Air & Space Magazine. Air & Space/Smithsonian. December 2014. "SR-71 and SR-72 engine cycle comparison". Aviation Week & Space Technology. "SR-71 Blackbird Movies Collections". NASA Dryden Flight Research Center. Kevin Svetcos (9 July 2001). "The SR-71 Pilot Full Pressure Suit". Leland R. Haynes. Peter Law (2005). "SR-71 fuel system, environmental control system, propulsion system". Archived from the original on 2 December 2016. Thomas C Mangan (2013). "Blackbird Spotting : A-12 / YF-12A / MD-21 / SR-71". Google Maps. Archived from the original on 9 November 2013. Markus Voelter and Nora Ludewig (31 March 2012). omega tau Podcast, Episode 091 – Flying the SR-71 Blackbird.